Panasonic TX-65FZ950 4K OLED (2018) hands-on hands on review | What Hi-Fi? Panasonic’s flagship 2018 4K OLED TV features new picture processing, a Technics-tuned speaker and HDR10+ support – so what do we make of it from a first look? While Panasonic’s TV presence last CES was a one-man show (the EZ1000), this year the attention is split between two new 2018 OLED series: the FZ950 and FZ800, each with 55in and 65in models. The FZ950 is the flagship (only defined by the fact it boasts a soundbar), and as Las Vegas (CES’ home) has aroused in us a ‘bigger is better’ outlook, we’ve focused most of our ogling on the 65in (TX-65FZ950). For starters, the TX-65FZ950 has a new OLED panel – still sourced from LG Display and likely the one behind new rival 2018 OLEDs too. But more importantly, it’s powered by Panasonic’s next-gen HCX processor, which is behind several new picture-enhancing features for the new 2018 models. The biggest is arguably the introduction of ‘Dynamic LUT’ (or ‘Dynamic Look-up Table’). For the uninitiated, an LUT is essentially a table of numbers that takes an image and corrects it (whether in terms of saturation, brightness or contrast - or all three), and is typically fixed and applied just once to the content source. Making that process dynamic, however, means the picture is being analysed every millisecond to select the most optimal LUT on a scene-by-scene basis depending on its brightness. Why? To bring picture improvements - especially to mid-brightness scenes. As HDR has brought dynamic metadata (i.e. Dolby Vision and HDR10+ - more on that later) into play, Panasonic believes this level of processing has become necessary. As well as Panasonic’s LUTs, the Japanese giant aims to deliver on its ‘bringing Hollywood to your home’ tagline via a fledgling HDR format and industry partnerships. Panasonic has a proud partnership with post-production firms Technicolor and Deluxe – the EZ1000 TV is the reference consumer monitor for their colourist work, and Deluxe is behind the tuning of the Panasonic TVs’ True Cinema picture mode. Well, supposedly adhering to a request from such partners, Panasonic has increased calibration steps at the lowest (i.e. darkest) end of the colour gamut. That means the four new Panasonic OLED TVs support calibration at 5 per cent, and – in an industry first – 2.5 per cent luminance within Panasonic’s Colour Management System settings, allowing users extra tweaking of luminance levels in very low-lit scenes. Unfortunately we weren’t able to take the reigns at the demo, so the benefit of that remains to be seen - as does other functions in the menu, such as the Auto HDR Brightness Enhancer function, which allows users to adjust how HDR content looks in a brighter room. It’s a nice idea and, if effective, one we imagine folk who don’t always watch TV with the lights down will appreciate. But what we could see in action, however, was HDR10+, which is a dynamic metadata HDR format that works in a similar fashion to – and directly rivals – Dolby Vision HDR. A series of trailers provided by 20th Century Fox (also a member of the HDR10+ Alliance) were displayed in HDR10+. 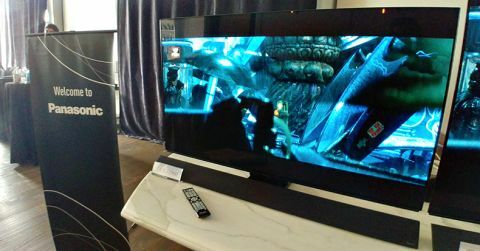 For comparative purposes, we also witnessed this HDR format compared with standard HDR10 on one of Panasonic’s yet-to-be-announced 2018 LCD TVs. The difference proved quite noticeable, and in HDR10+’s favour. But for now only Amazon Prime Video supports HDR10+ on the content side - and even then, that’s only on select TVs. HDR10+ may look promising as a technology, but in terms of industry support it’s not even warm on the heels of Vision... yet. What better way, too, to show the developments of Panasonic’s LUTs than to roll out the TX-FZ950 next to 2017’s flagship TX-65EZ1000. A series of beaches, skies and landscapes were played through both screens, and the TX-FZ950 came out on top, displaying notable degrees of greater brightness and definition compared with the TX-65EZ1000, which follows the standard (or if you like, static) LUT process. Naturally, we look forward to putting it through the ringer later this year, but for now we can be satisfied Panasonic has a good chance in remaining competitive in the market with this OLED. And that goes for the TV sound department too. Panasonic introduced the Dynamic Blade speaker in last year’s EZ1000, and the TX-65FZ950 features the latest version, which takes advantage of Panasonic’s audio arm this time by being tuned by Technics. We heard a music demo on standard sound mode (there’s also music, stadium, speech and custom options) through both the TX-FZ950’s speaker and the EZ1000’s and the newer TV did indeed sound fuller and clearer through the 20-watt tweeter, 20-watt midrange and 40-watt woofer configuration. Vocals were more heartily fleshed out. But it’ll take an actual film, more scrutiny and better test conditions for us to determine whether it’s worth the premium price over its sibling, the TZ-65FZ800. The Dynamic Blade speaker is actually the only thing worth noting of the TX-65FZ950’s physical design, too. Built into – and connected via – the stand, and lying the width of the screen, its reclined stature and discreet Technics logo is really rather eye-catching. As for the OS design, we’ll see a (probably updated) version of My Home Screen across Panasonic’s 2018 smart tellies - which is more than fine in our book. While we have to wait patiently for further specs (such as peak nit level and connections), what we’ve seen so far is encouraging. Of course, the success of its campaign will largely depend on how competitively it’s priced. After all, the TX-65EZ1000 arrived last summer with a £7,000 price tag. But while prices for the new 2018 OLEDs haven’t been confirmed, a Panasonic spokesperson said it’d be more in-line with rival 65in OLED models, so we can take a stab at around the £3000 to £4000 mark, with the TX-65FZ800 coming in a few hundred pounds below the FZ950. What’s out of Panasonic's hands is the rather impressive-looking competition from LG and Sony on the OLED front. As always, we look forward to seeing how the scrap pans out.